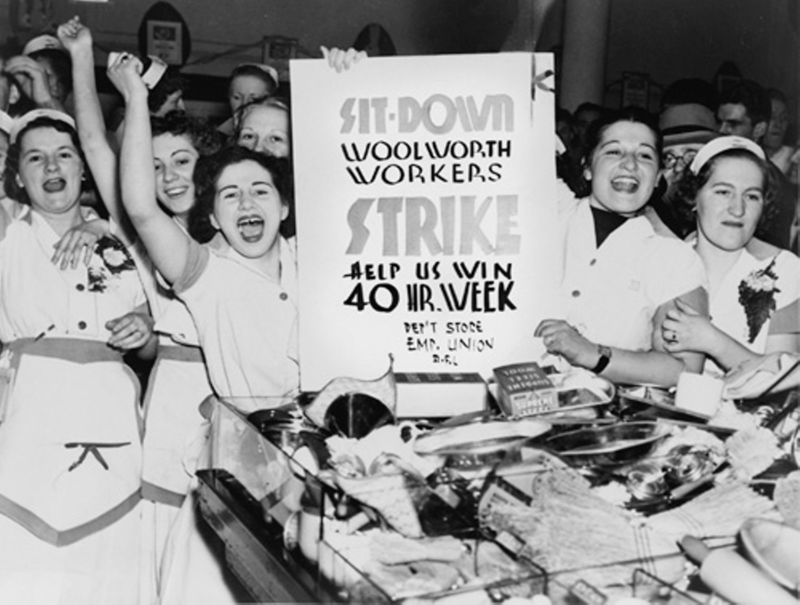 The strike is still labor's most indispensable tool. What can we do to revive it? For Occupy Wall Street, the hole in the curtain was definitively torn open on October 14. In the dead of night, when word went out that Michael Bloomberg was sending the police to Zuccotti Park to force an end to the month-long occupation, an emergency call for help went out from OWS. In response, New York City’s Central Labor Council urged its 1.3 million members to rush to the square to protect the encampment from the cops, and by early morning roughly a thousand people, including hundreds of trade unionists from the Communications Workers, SEIU, and the Teamsters, had gathered and linked arms in defense. In the end, of course, Bloomberg blinked and that morning’s raid was called off — giving the occupiers and their defenders not only a crucial month-long reprieve, but the unfamiliar and exhilarating feeling that they could defeat New York City’s massed forces of guns and money. What happened that morning was important: the occupiers had defied the laws of private property — and through the power of numbers and solidarity they had gotten away with it. A lot of the younger contingent in Occupy Wall Street had never had many dealings with the unions that had rendered this act of solidarity. And despite the promising, if halting, attempts at cooperation, many of them — especially those who consider themselves to be on the movement’s radical edge — are openly dismissive of unions. And why shouldn’t they be? Not only has the organized section of the working class shrunk relentlessly to just 12 percent, but by all appearances its organizations long ago turned into the kind of hopelessly desiccated simulacra of resistance that young radicals and proto-radicals avoid like the plague. In the public mind, union “activism” in recent years has been associated with images of defeat: hundreds of identically t-shirted workers bused in to forlorn protests on the National Mall; stultifying rallies featuring scripted speeches delivered in front of slogan-printed backdrops; and the occasional kabuki “strike” that seems more like a sullen and oddly masochistic PR stunt than an instance of direct action. But while it is easy to see the external qualities that make the labor movement appear to be just another feature in the landscape of capitalist realism in the eyes of the young advocates of militant direct action, few really understand how this situation came about. How did a movement, a practice, that once could inspire radicals with street battles and occupations, bravura feats of solidarity and heroism — that once tore holes in the curtain of capitalist hegemony almost as a matter of course — morph into the slick and routine management of decline personified by Andy Stern? There are shelves of books on labor history that recount important aspects of this story, from state repression to working-class racism to party politics. But Reviving the Strike: How Working People Can Regain Power and Transform America, published in 2011 by Joe Burns, a union negotiator in Minneapolis, demystifies what is probably the most tangible element in modern labor’s aura of lifelessness: the virtual disappearance of the strike. And in telling the story of the strike’s disappearance, Burns inadvertently reveals that young radicals who scorn unions and the aging bureaucrats who run them have more in common than one might think. At the center of Burns’s story is what he calls “the traditional strike,” which was the heart of trade union activity from the beginnings of labor history until its virtual disappearance after the 1970s. The crucial characteristic of the traditional strike — its sole reason for being — is that it forces capital to stop production. Although this fact may seem slightly obvious, its significance for both workers and radicals has been largely forgotten. In the earliest days, when the labor movement was dominated by skilled craft workers who could not be easily replaced, a strike could simply consist of workers putting down their tools until their employers had met their demands. But with the advent of mass production, the majority of workers were now unskilled or semi-skilled and simply walking out on their jobs would only get them fired and replaced with scabs. The traditional strike was an open and unabashed physical attack on the private property rights of the capitalist, and this fact was never denied by the mainstream leaders of the trade union movement. Perhaps the most convincing feature of Burns’s account is that despite the author’s personal identification with the radical strand of the union tradition, he goes out of his way to draw on examples from the most conservative figures in labor history: the Samuel Gompers, the Dave Becks, the George Meanys. These leaders not only accepted but took for granted that the labor movement must use or credibly threaten to use force to shut down capitalist production and that without this tool, nothing could be achieved by the trade union movement. “A strike can only be effective if and when it brings about a cessation of production. It is an absolute interference on the part of workers with the right of employers to make profit.” So said Homer Martin, the conservative former Baptist minister handpicked by the Gompersite AFL leadership to serve briefly as the first United Auto Workers (UAW) president (before being overthrown by a more militant faction). Radical tactics could only exist with a radical theory to support them. The act of blockading a private building in defiance of the police, the resort to forceful measures against scabs, are acts so deeply at odds with the law-abiding instincts of most people — working class, middle class, or otherwise — that they will not do them without a clear account in their own minds of why such behavior is justified. That is why in the era of the traditional strike the labor movement was obliged to hold and propagate a counter-capitalist ideology based around the simple slogan that “labor is not a commodity” — the notion that it is illegitimate to treat human labor as something to be bought and sold for a market-clearing price, and that striking workers are therefore justified in using all necessary means to disrupt its sale. Unions not only believed stopping production was their sole effective means of striking; they considered it to be, ultimately, their only source of power. Again, this notion was a truism, enshrined in college labor textbooks. All this should give some sense of why the near disappearance of the production-halting strike since the 1980s is a phenomenon of such far-reaching importance. A large section of Burns’s book is devoted to meticulously tracing the path that led to today’s situation. Companies entered the post-WWII period sufficiently scarred by the militancy of the 1930s and sufficiently cowed by popular acceptance of working-class direct action that an “unspoken norm” developed, according to which management responded to any breakdown in collective bargaining by shutting down production on its own. This prevented the outbreaks of violence and embitterment associated with strikes and provided a calm atmosphere in which negotiations could take place. But meanwhile, during this period of relative harmony, the judicial and political systems were quietly and insidiously entrapping the unions in a little-understood web of repressive measures that collectively make up what Burns calls “the system of labor control.” The system, which developed gradually from the late 1930s through the 1960s, functions as an organic whole. No one piece destroyed the strike on its own; rather, each element carefully reinforces all the others. One of the system’s remarkable aspects is how juridically unorthodox it often is: as law scholars regularly point out, many court decisions clearly contradict the stated text of the National Labor Relations Act. Meanwhile, labor legislation often resorts to startlingly coercive state intervention to achieve its capitalist ends. The system is too elaborate to explain here in full, but a few details will give a flavor of how it operates. These measures placed serious obstacles in the way of successful strikes. But the real ticking time bomb of labor law was the Supreme Court’s 1938 decision in NLRB v. Mackay Radio giving employers the right to permanently replace striking workers. One of the most criticized decisions in legal history, the “Mackay doctrine” discovered a previously unknown distinction between “discharging” striking workers — which the court acknowledged was not permitted by the NLRA — and merely “replacing” them permanently with scabs. As a result of this decision, the United States remains one of the few democratic countries in the world where strikers can be permanently replaced. Since the 1980s, the very idea of the production-halting strike has gradually dropped out of circulation among labor leaders. Today it is virtually forgotten. In its place has sprouted a panoply of alternative panaceas for restoring labor’s strength — social unionism, community partnerships, the focus on organizing — all of which avoid the central issue. In discussing this evasion, Burns scores the timidity of the dominant thinking within the labor movement. Yet in doing so he (inadvertently) calls to mind something unexpected: the ironic parallel between the anti-union radicalism within the Occupy movements and the well-ensconced union bureaucrats themselves. During the late 1970s and 1980s, when many of these activists entered the labor establishment, the leadership of most international unions was intensely conservative and hostile to progressive ideas. Working within a labor movement that lacked an aggressive or cohesive left wing, many formerly progressive policymakers accepted the new, management-centric order that was being created within the movement by the employer onslaught of the 1980s. Meanwhile, today’s generation of young radicals, like the progressive labor bureaucrats have spent all of their formative years living in the era of capitalist realism — the era of There is No Alternative. And it’s perhaps for this reason that each tenet of the union bureaucrat philosophy that Burns recounts finds its distorted mirror image in the views of the young anti-union radicals. After all, the prevailing attitude in certain precincts of the Occupy movement is that unions by their very nature will never break the law. That workplaces are not at the center of the struggle. That middle-class intellectuals and full-time activists should take the lead role in strategy and that these groups do not have different material interests than rank-and-file workers. That building “communes,” rather than confronting capital, should be the movement’s main mission. And, above all, that one can tacitly resign oneself to the permanence of capitalism and neoliberalism and still devise effective movement tactics. The irony is poignant. When Burns writes that “conservative trade unionists such as Samuel Gompers were more radical than even today’s labor left,” the same could be said of many of the Occupy movement’s young intellectuals. He argues that a militant current within the existing unions could support the creation of independent worker organizations possessing no assets and no property. These organizations would be able to violate Taft-Hartley and other laws: to strike and organize using tactics that defy the authorities and target the shutdown of production without fear of losing years of accumulated strike funds in lawsuits or court fines. There are precedents: the Mineworkers’ sponsorship of Communist-led steelworker organizing in the mid 1930s; the establishment of AFL federal unions in the same period, most of whose members ended up joining the CIO. The basic concept was even endorsed by the American Federation of Teachers in a 2005 memo on possible future labor strategies. The idea is straightforward, but it is sufficiently unconventional and risky that it is hard to imagine it happening in the absence of a once-in-a-generation radical upsurge. Burns published his book last May — four months before the occupation of Zuccotti Park. Since then, a radical mobilization that many of us doubted we would see in our lifetimes has erupted. If we, as activists, students and intellectuals are serious about challenging capitalism, we will ask how we can help to foster a militant rank-and-file led workers’ movement. Because there are millions of them and far fewer of us. And without mass radicalization within the working class, sooner or later the oppressive curtain of capitalist realism will descend on us once again. The strike is still labor’s most indispensable tool. What can we do to revive it?